To make the dressing, mix all the ingrdients together. To pan fry the chicken, heat the oil in a frying pan, add the chicken and fry on a medium high heat for 2 minutes each side. Then turn down the heat and fry very gently for a further 4 minutes each side, with a lid on the pan. If the chicken breasts are thinner, fry for just 3 minuters each side on the lower heat. Season well with salt and pepper. Remove from the pan, leave for a few minutes and then slice. Cut the halloumi into 1 cm slices and fry, in the same frying pan, on a fairly high heat until golden brown on both sides. Remove from the pan and cut each slice in half. 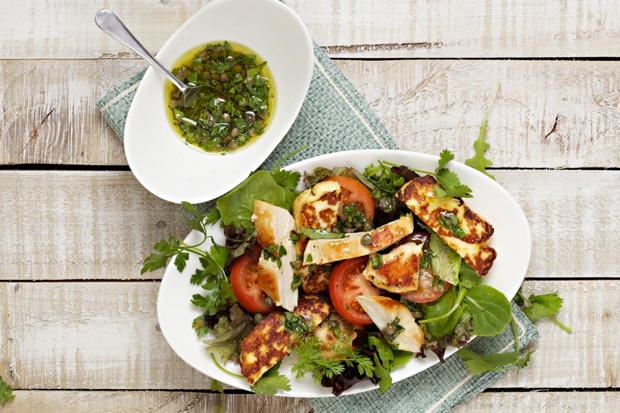 Arrange the herb leaves and tomatoes on plates and distribute the chicken and the halloumi between the plates. Drizzle the dressing over the top and serve.